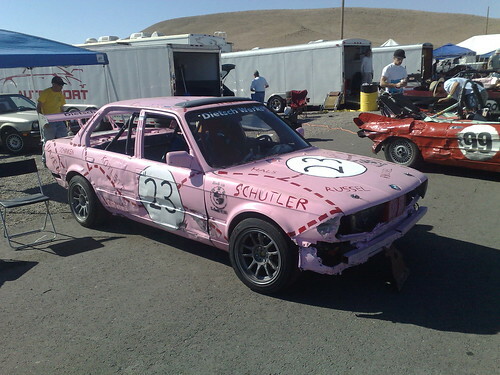 The Goin’ For Broken race at Reno Fernley raceway was the 5th 24 Hours of LeMons race for the Formula BMW team and the debut of our new Pink Pig race livery. Additionally the car was quite a bit lighter than the last race with the sunroof, dash, heater core and inner door skins being removed. We cracked our windshield during the dash removal which we replaced with a sheet of lexan to further drop weight. We were going with our regular driver lineup of Guy Argo and GGLC members Gabriel Matus, Rob Dietsch and myself. Since the racedays were of unequal length (8.5 hours Saturday, 5 hours Sunday), our plan was to have Guy, Rob and myself run a single 3 – 3.5 hour stint with Gabe splitting his stint between the two days. The long stints would minimize our driver changes and would allow us to pass people in the pits and finish higher than the 10th place we recorded at Thunderhill 08. When I first went out under green my immediate impression was that we were waaaay faster than most of the cars out there and was passing several cars at each turn. This was probably down to my familiarity with the track and the car because after about 5-10 laps the cars became more difficult to pass as the other drivers became more comfortable with the track. About an hour into the race I noticed that the fuel gauge on the car was still registering full despite having plenty of hard racing laps in that time. This meant that our gauge was broken and we would have to time our pitstops based on fuel starvation. At about the 2 hour mark the car started fuel-starving on the fast right of turn 14 but was still doing pretty well elsewhere on track. We decided to keep going as long as we could and/or to wait for the next yellow. I kept driving the car in higher gears to help with the fuel economy but after about 5-6 laps the fuel starvation was getting bad enough that we were sputtering on the straights after right handers and i brought the car in for a green flag fuel and driver stop. It was about the 2.5 hour mark when I came in and despite the fact that my long stint had put us back on the lead lap (9th overall), we were still well short of the 3+ hour stint we were originally planning on. The good part was that we knew that we could use the right hand turn fuel starvation as a gas gauge to decide when to time our next pit stop. Guy drove the next stint and kept in touch with the leaders. At this point we knew that we were in the top ten and were basically trying to put in reasonable laps without doing anything crazy. Guy drove for about 3.5 hours before the fuel starvation became bad enough that we were forced to do another green flag stop. At this point we were 4th overall and just 5 laps behind the race leader despite having the slowest “fastest lap” of any car in the top 15. Gabe got into the car with about 2.5 hours left in the day and was putting in some excellent lap times when he had an unfortunate spin at turn 15 which brought us in for a black flag penalty. Since we had been good racers for most of the day (and bribed the judges with some excellent Guatemalan rum 😉 ) we were let off with a driver change penalty which put me in back in the driver seat for the final 10 laps of the day. At this point the traffic had thinned considerably and I was able to able to drop my fastest lap down from a 2:51.844 to a 2:46.177. Right about this time the #72 E30 of the B-Team (who I knew from Lotus Talk) pulled up right behind me and tried to get past. I knew that I wasn’t racing them for position so I did not try to block, but I certainly wasn’t going to move aside and let them past either. They tried a few different attempts at getting past but I hung onto the inside line and was able to stay in front. About 5 laps into the battle they came right alongside me on the front straight which led to the action you see in the image below. Source photos from Jeff M/The B-Team. Animation by Rahul Nair. 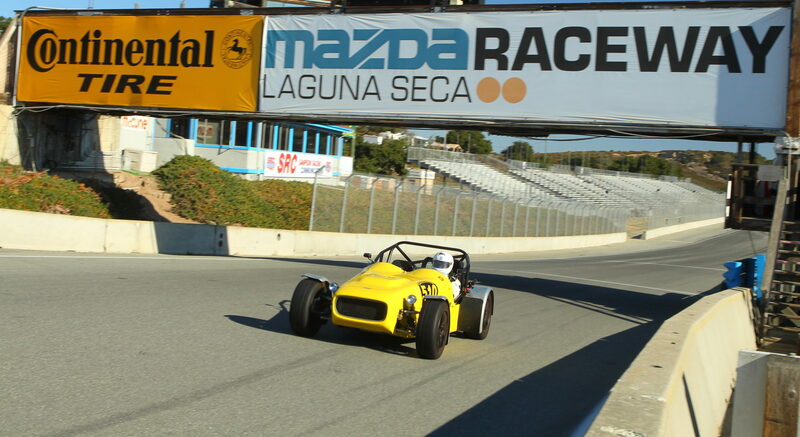 This moment started as we were coming onto the main straight when I got a bad run into the corner while the B-Team got a great slingshot out and pulled alongside me down the straight. This had happened a couple of times before but since I always held the inside line into the esses they had had to lift in the end and tuck in line behind me. On this particular lap the #26 Team Carpet Pissers CRX was pulling out of the pits and made it into the first bend of the esses right just before the two of us. Normally I would have tucked in line behind the CRX and passed them going into turn 2 but on this lap I spotted an opening and decided to pass them between the 2nd and 3rd esses expecting that the B-Team would get boxed in behind them which would give me some more breathing room. As luck would have it the B-Team driver decided to do the exact same thing on the outside and suddenly we were three wide through the turn at about 95mph. I was up on the rumble strip on the left while the B-Team was on 2 wheels in the gravel on the right. At this point the driver in the CRX sees the B-Team on his right (and I suppose didnt see me on his left) and jinks left to avoid them. The front bumper of his car hits my right front wheel and leaves a black line down both doors. 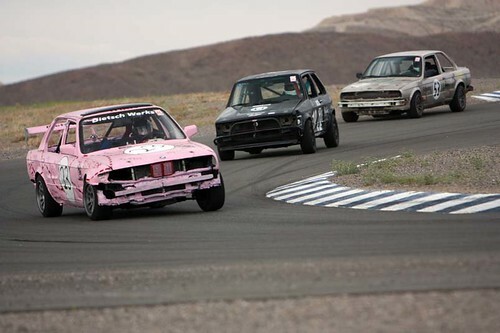 The impacts pushes my car to the left but I am able to maintain control while the CRX unfortunately spins out. Amazingly both B-Team and I are still side by side entering turn 2 and I am able to get ahead under braking. While it looked (and was) pretty exciting it was still a dumb move on my part especially since we were not racing for position and the next day both B-Team and I went up to the driver of the CRX and apologized for putting him in a difficult spot. At the end of day one we had completed 129 laps and we in 4th place overall, 6 laps behind the Eyesore Racing FrankenMiata. We were still the second slowest fast lap in the top 10 but we used our long stints to make up for our wheel issues at the start as well as 3 green flag pit stops. Now we just had to keep on doing more of the same for day 2 and hope that the leaders would trip-up enough for us to pass them in the pits. Day 2 started with Gabe driving the car. It was obvious from the lap times that we had no chance on catching the FrankenMiata with speed alone. They were pulling away from us at 10 seconds a lap when they suddelny spun and stalled on course on lap 5. As they were being towed in we began to push like hell to make up laps and we got back 4 of the 6 laps before they got out on course again. Gabe kept putting in consistent laps but the FrankenMiata was back on pace and was consistant pulling out 8 seconds or so per lap. Both teams came in for a driver swap just a lap apart which kept us 3 laps behind with 3 hours to go. Rob put in some stellar laptimes including our fastest race lap of a 2:42.809 but in the end it just was not enough to catch the FrankenMiata. We are counting the best 4 of 6 events. If you are participating in the series, please make sure your vehicle details are up to date. 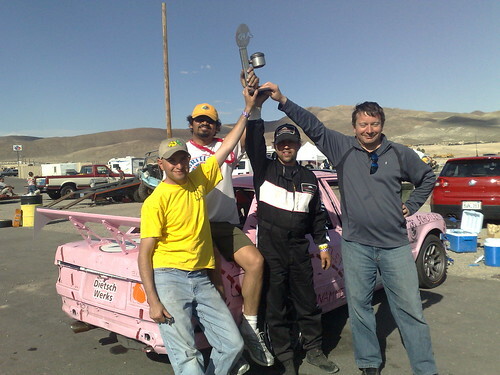 GGLC members Gabriel Matus and Rahul Nair joined GGLC President Robert Dietsch to take a class win and finish fifth overall at the 24 Hours of Lemons endurance race at Reno Fernley. More details to follow soon. Formula 1 photographer Darren Heath has put together this excellent photo essay of the 2009 Spanish Grand Prix. Click here to view in full size. This second video includes road and track driving impressions from Matt. The Evora is planted and secure, yet picks apart corners with a light and playful feel that always makes mid-engine cars feel so special—think Ferrari F430, only with better steering. The Evora marks a turning point for the British maker. This may be the first-ever Lotus built for everyone. In terms of build quality and the solidity of its presentation, the Evora is easily the most mature Lotus yet. While heavier than most of its predecessors, none will doubt they are driving a car built by people who place a premium on roadholding and handling. However, the major surprise is the Evora’s suitability for day-long journeys; the creamy torque of the engine, the way the suspension quietly absorbs bumps and suppresses the coarse surfaces so often found in rural Scotland, the rock-like rigidity of the chassis and the richness of its cabin trim and equipment are all new areas for Lotus. This is a car truly suitable for a week’s all-roads European grand touring, the first of the marque to achieve it. First impressions: typical Lotus ride/handling but much more grown-up. There’s even a properly good hi-fi! But the really successful elements of Project Eagle – stiff, versatile chassis, stunning looks and superb handling – are what the Elise was about fifteen years ago. A mid-engined supercar so compliant, refined and quiet it doesn’t feel as if made in a Norfolk shed, says Jeremy Clarkson. Click through to read the full article. The 2019 West Coast Lotus Meet is a Go!